mikeatwood8hm3 has no other items for sale. Sales tax may apply when shipping to: IA*, MN*, MO*(6.225%), WA*. Nice and clean and a good assortment of blocks and other parts. As described and fast shipping. Thanks! Will be purchasing more 13 year old son loves the pieces!! Exaclty what I was looking for, will be back for more! Very pleased with our purchase! Great variety, look brand new and great price! 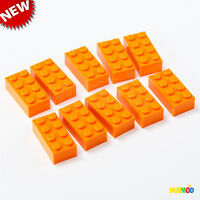 I will definitely be ordering again if my children need more legos! Thank you so much! Not clean at all. I even found pubic hair (more than one) and other hair. Not all Lego brand either. 60/40 maybe 70/30 at best. I even found what looks to be a coffee straw All that being said there is a lot of good pieces and specialty pieces (cups,ax, broom, phone, binoculars, skate board, and more) Had it not been for the pubic hair this maybe would not have been such a deal. The ad says two things: CLEAN AND 100% LEGO. NOT AT ALL THE CASE. I've ordered 3 pounds with intension to buy more if the selection meets our needs. 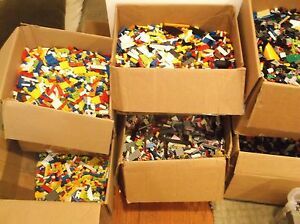 This lot is good when you need parts to build cars/planes (10% of car/plane parts, but only couple of wheels) or little houses (15% are house building parts, lots of roof pieces, several windows), but amount of classic bricks (2x4, 2x3, 2x2, other 2xN or 1x1) is small, not enough to build any large projects. 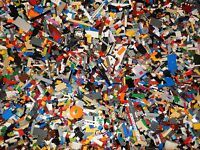 And the variety of colors is very limited--mostly gray (spaceships or cars) or pink/blue/red (Lego Friends theme). Good selection of flat bricks (good for cars/planes). 15% of parts are very hard to play parts from specific sets or simply decorative pieces. Don't know what to do with them, maybe my child will find some of them inspiring. Some unpleasant surprises I've got in my order: some brick creations weren't disassembled (and, of course, all bricks inside are not sanitized), ~15 bricks were covered in dirt/glue/play dough, also there were 3 non-Lego bricks. I've sorted through most of my order, see attached picture for overview. I think that I've got what I've paid for: playable, but lots of unusable parts. A great mix random pieces, small, medium and large. The 3 lbs. I purchased had some regular building blocks but also the special pieces from other set. A great addition to our collection. Already have recommended to another person and would buy again. My son loves Lego's. Who doesn't? I need to say that I wasn't expecting to receive the Lego's until the 12th, but they were delivered on the 8th. My son's b-day on the 13th, I know cutting it short. There are so many great pieces. Three mini figs with many extra's. My son received a fire fighter, which made his day. I can hear him yelling from upstairs as I write this review. LOL. He just yelled, 'Yes, I wanted this piece." 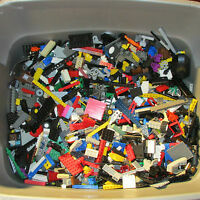 The Lego's come as stated, clean and all in like new/used condition. I am thankful, and will be ordering more. My son is autistic so he will of used these in a matter of days. Thanks for making his day!